I decided this week to have a small look at the progress I've made in the past few months. The blog itself was built originally with the idea for me to be able to record my progress, reflect and continue moving forward. It has allowed me to do that quite thoroughly - not to mention looking at how my work has changed ever since I had started to practice and focus on improving. Coding is perhaps the biggest area that I've seen improvement in. Admitingly - the coding I work with primarily up to this point is GML - GameMaker's own language. Having gone from little to no experience with coding - to be able to code a number of small projects, experiments and systems - at the beginning with some guidelines and now a days with next to none unless it is a feature or function that I have never worked with prior. In terms of Pixel Art - I've seen improvements in a lot of areas. Most importantly is likely characters as that was my weakest point and possibly the type of sprite I felt more intimidated to create. Besides this I feel I also managed to improve less immediately observable elements - this include elements of Game Design and the philosophy behind creating an experience for the player through the game itself. 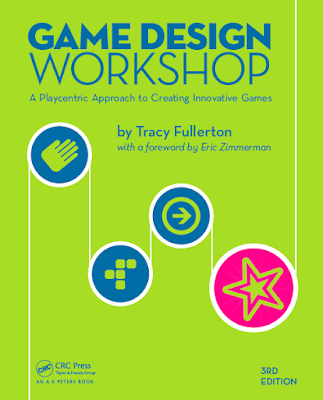 Having covered some very insightful books such as Designing Games: A Guide To Engineering Experiences by Tynan Sylvester and Game Design Workshop by Tracy Fullerton. Aside from this - I have always gained more experience in Java, HTML and CSS, Audio Production and a few other skills that will prove useful in developing digital games. Outside of this - I have also earned my University Bachelor's Degree in Commerce and have been accepted into a Master's Programme on Digital Game Development - which will definitely be a major asset in terms of my capabilities to improve my skill-set and also meet and collaborate with individuals within the Digital Games Industry! Moving forward - I am incredibly excited knowing that I will be able to place a much larger portion of my attention towards Game Development. Although I will still ensure I cover areas involving business, history and so on - as the skills and knowledge these provide are both useful and handy to have in hand. They are also areas I have an interest in as well - being able to utilize the knowledge gained from these other areas in Game Development is something that I find joy in being able to do. Regardless - to all those who read my blog - thank you for your continued support. It does mean a lot to me knowing that there are those who have an interest in seeing and reading about my journey. To those of you who are still starting off game development for example, I do hope the blog is proving to be useful - be it in inspiring you or even as a form of reference to other elements. Again, thank you all for your support! This week I bring you a post that is focused towards bringing inspiration from history to fantasy settings. One of the challenges and joys I find, of creating a new fantasy world is that of making a compelling and often authentic world. When I say authentic - I do not mean 'realistic' in the traditional sense - but rather believable - making sure it is consistent and makes sense in the eyes of those experiencing it should they live within that world. This post - as will others of this type, will provide elements of real-world history based on research I've made that can be used both as inspiration and ideas for fantasy worlds. It seemed natural to begin with Malta - my home country. Please note that research was done using mostly secondary and tertiary sources of information - so keep this in mind as you are reading through. What this means is that the information present is not directly from documents that speak of these events. Information used is from, not exclusively Museum visits, and online research. Whilst this information may hopefully be useful for the sake of inspiration for example - I do recommend further research to confirm the information if you are seeking solid information on the history of Malta for the sake of things such as, but not exclusively, academic work. Think of this as more of an exploration and research of an individual. Malta, an island to the south of Sicily, Italy, has been part of rich historic events. Dating from the fall of Carthage to Rome, to the defeat of Ottomans by the Knights of Saint John and their Maltese allies. The island has a rich history of medieval fortifications and is the center of a very key concept I would like to discuss today. The timeline provided will also be useful should you wish to follow through historical events or conduct your own research on specific points of history. Malta itself - is an island deprived of much natural resources. During the periods of the first settlers of the island - the island was far richer in vegetation, which likely formed the basis as to why the settlers chose to settle on the islands. Food would have been abundant - and fishing would have provided when foraging would not. Tools however - would need to be made from wood, stone, or brought from other lands. Bronze, obsidian and other types of tools would have been brought from, most likely, Sicily. The material would be recycled and re-used as often as possible due to the scarcity of it's availability. One particular resource that was sought after highly during these periods were the corals that were used to create jewelry. These coral jewelry were seen as good charms - and high demand saw the diminishing of Malta's coral life. When Phoenician traders arrived on the island's shores - they were highly welcomes by the locals. Eventually choosing to creating a colony on the island - and which are believed to give the island it's name sake Malat, meaning something along the lines of sanctuary. Being the savvy sailors they were - the Phoenicians enjoyed having a strategic place to settle during storms for their trade ships. Eventually - the Phoenicians fell to the Persian empire; Carthage - a previously Phoenician colony took Malta under it's wing. The Carthaginians were quick to solidify the advantage they took from Malta's strategic location. Malta was turned into a Carthaginian naval base. This was perhaps the first point we begin seeing Malta's evolution as a fortress economy. Malta would serve as both a trade center for Carthage as well as a launching platform for the Carthaginian fleet. Whether the island served to construct ships, or simply maintain and house them - is up for debate. The island's lack of timber supply would likely mean that timber would need to be transported to the island - which wouldn't make much sense if the ships could be built elsewhere. Following the fall of Carthage - Malta went into the hands of the Romans. Malta was of little significance in terms of resources for the Romans - especially due to it's vast scale. Malta however - did offer the same benefits to the Romans in terms of being strategically located in the midst of trade routes and a good supply point for Roman ships. As the Romans attained undisputed control of the Mediterranean - trade would have likely flourished - together with the island itself. Eventually - Roman veterans were also given lands within Malta - as rewards for their service. These veterans would provide the island with perhaps it's first fortified settlement - Melita. Malta would be conquered by the Vandals, Goths and eventually returned to the Romans (Byzantines) until the island is captured by Aghlabid Arabs. The Arabs would reduce the size of Melita - and form Medina - the city which would be the precursor to Mdina. The Arabs also introduced cotton and cirtus fruit, as well as new agricultural practices and irrigation systems. The Arabs also constructed a fort on the location of present day, Fort St. Angelo. Eventually - after being under Norman control, the Knights of Saint John would be granted Malta by Emperor Charles V.
The Knights would construct fortifications on the island, conduct corsairing activities and raid Ottoman trade routes before repelling an invasion by the Ottoman empire. The Knights would continue to construct fortifications for the decades to come. Until eventually the French - under Napoleon Bonaparte would come to Malta and bring forth extensive reforms - until being kicked out of Malta by the Maltese for the sacking of churches and cathedrals, eventually with the aid of the British. Malta would become a critical naval outpost for the British. Prospering during war-time but suffering during peace. Eventually - with the opening of the Suez Canal - Malta would again prosper for a time. This common theme throughout history as Malta's importance grew extensively when it's strategic location came into play. However, during times of peace, and with improvements of ships that allowed for lesser maintenance and longer range, Malta's key position for trade began to waver. Malta's size meant that mass manufacturing would not compete with that of foreign nations. For a time, cotton production was lucrative some time during the wars in America - as cotton production from Americas was halted. The ports and hospitals of Malta would see extensive use during world war 1; and during world war 2 - Malta would bear massive hits by bombing raids from the Axis powers. With all this - Malta's role in the modern day after gaining it's independence and becoming a republic - meant that the fortress economy needed to be changed. Especially since Malta's position in the global arena was a neutral country that would seek to bring peace. This means that Malta's old prosperity during war, and down slope during peace - needed to change. Malta would change it's economic situation by focusing on areas such as Tourism, Financial Services and IT. Which gave the island a way to utilize the least land but provide high returns. Malta's greatest resource would be it's citizens - meaning that an investment to the individual citizens of the nation - would be a key investment in the economy of the country. Needless to say - this goes for any nation, however for a nation deprived of natural resources - the logic behind it is perhaps more obvious. What does this all mean in a fantasy setting? Needless to say - you can come up with a vast amount of ideas on your own - however understanding Malta's role and it's evolution would likely give you a solid foundation to start with. Malta's position has meant that the island - although deprived of natural resources, would be sought after. It's citizens would be key actors throughout history - experiencing different rulers, different conditions and different cultures. The fortress economy - prospering during war, and faltering during peace, meant the island would have to endure times of poverty - interrupted by times of great importance during unstable times. I hope you find inspiration in the history of this small island rich of story in the Mediterranean. I also hope you enjoyed this post and look forward to more historical inspirations throughout history! I wanted to tell you about a book I had read a couple of weeks ago after having had the time to reflect on the material present within the book. If you are someone who enjoys not only reading about the various concepts, tools and ideas surrounding game design but also enjoys delving into stories by individuals within the field, then you are in for a treat. One of the highlights for me personally within Game Design Workshop is the sheer amount of stories and opinions brought forward by the author through what seems to be interviews near the end of each section or within the section itself. As each individual not only talk about their entrance into the industry - but also their approach to various concepts such as prototyping and the design process. The book also offers 'exercises' throughout the various chapters of the book as the author guides the reader through design thinking towards actually getting your game out into the industry! If you are a complete beginner - this book is definitely a very good place to start out in learning how Game Design plays it's part within game development! If you are already fairly knowledgeable within the field - the various small sections of insights from various other game designers may still be interesting and have information that you may find useful! This is a book I highly recommend for individuals looking to begin delving into the field of Game Design. The author explains the various concepts and ideas very well - and the insights from other game designers within the field is both a nice change of pace as you read and a new perspective on game design which is a welcomed element in my eyes! I hope you find this information useful if you are looking for a book on game design or you are considering to purchase this particular book! I wanted to talk about something which really struck me during the past week. I've been visiting a fair amount of Museums in my home-country of Malta - ranging from historical armouries to archaeology and war museums. I always did enjoy museums - particularly ones that touch on military and history of a nation. However - I never really went a head and visited a large number of places outside of a school field trip when I was younger. I realised that I have a new-found appreciation for these historical places - particularly as I learn about Game Design and World Design. Throughout my visits I would consistently picture how a society would develop and grow from small beginnings to becoming a fully-fledged nation. When I visited the Palace Armoury - I saw a wider selection of armours and details which before I only saw with pictures. Seeing the real item however - you realise that there is more to item itself. Seeing different types of armours - such as Siege Armour which I was previously partially unaware of - gave me not only ideas of how fantasy armours would work but also what would even make sense. Visiting the National Museum of Archaeology - I got a better appreciation of how a society develops within a region - starting from very small groups to eventually founding settlements and engaging in trade. Understanding the connection between culture and the development of these settlements was also an intriguing element. These are only two Museums - and them alone gave me inspiration and ideas for how to formulate my own worlds and designs! Many museums needless to say - do require an entrance fee - however if you are a student you can often receive a discounted price. More over - you may be able to purchase a bundle of tickets for a much lower price point! This is something worth considering when you want more inspiration for your own creations. Looking at history - especially visiting Museums - I find is something that really helps me to improve my ideas and designs. Particularly if you feel like your having a type of creative block - perhaps looking through history and seeing the stories of the past will help you tackle that creative block! The last couple of weeks have been fairly busy - I've decided to start working more on deciding how the hub area should look! The hub area will act as the player's base of operations. From here - the player can send recruiters to bring new troops, sell and buy equipment and review their archives which have lore and collectables. This will also be where the player can purchase upgrades to improve their forces - as well as the camp itself. Needless to say; the player will be spending and visiting the hub a fair amount - which means making it easy to use and pleasant to look at would definitely be a plus. As shown by the above image - there are only 3 structures that have a rough sketch prepared. The fences will represent the 'Venture to a dungeon' feature - that will allow the player to go on an expedition to a dungeon. Above it we have the store and to the left of that is the archives. Eventually - aside from adding structures for the Armoury and the Training Post - I would also wish to add a few decorative features - perhaps a well in the centre of the camp for example and crates storage. Small details that help bring the camp to life! 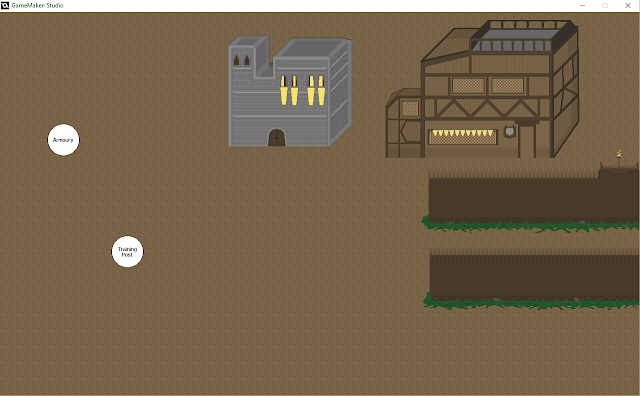 I am also considering adding for example soldiers patrolling around - however I will see to that when I get to it!